Before I go into the elaborate — cough cough — details of the Starbucks on 48th and Lexington, I want to address my brief hiatus. No really. One of my best friends turned 30 this past weekend, and we thought there would be no better way to welcome Gay Death — as some call it — then to take it to Las Vegas. This was my first time out there, and I won’t bore you with how I managed to escape with a $30 profit on the slot machines, how we ended up taking a Cirque du Soleil style gym class, or our belaboring flight delays. But I would like to mention the state of Starbucks in that city. Literally, before I left the airport I had passed two Starbucks coffee stands within the terminals. And once we got to The Strip it became pretty obvious that most every hotel/casino had at least 1 or more Starbucks inside. Here I thought Vegas ran on cigarettes, alcohol, and blind hope, but apparently Starbucks coffee has its role as well. Also worth mentioning is that all the casino Starbucks I visited were definitely licensed stores. Sometimes the pastries varied and not all took the Starbucks app as a form of payment. Still… it was pretty neat seeing how Starbucks is embedded in the flashing lights of that city. Now that I’m back, I’m determined to dive right in and finish off the remaining Starbucks I’ve yet to visit in NYC. 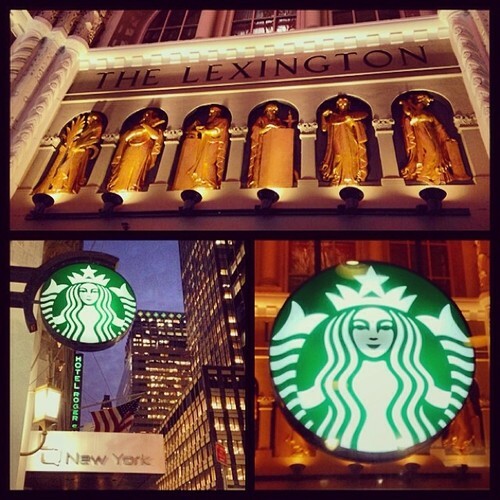 The Starbucks pictured above is on the corner of 48th and Lexington and is attached to The Lexington — a boutique Marriott hotel. It has a street entrance on Lexington and also feeds into The Lexington’s lobby. Essentially, this gives the Starbucks the feel of a small hallway — a coffee scented hallway, that is. It’s really small, has no seating, and no restroom of its own. But one thing it does have is some interesting decor. Pictured above is one of three identical wall plaques that line the entrance walls of the Starbucks. From outside looking in, this statuary immediately gave me a religious vibe. But I can also see some Greek or Roman attributes as well. Really, I can’t tell what or why these 6 figures represent. But they certainly bring a level of uniqueness to this small Midtown location. If you’re staying at The Lexington or in the area you should check it out — unless you’re strong proponent of the separation of church and Starbucks.